Groundhog Day is here again, and you know what that means: It's time for politicians and other dignitaries around the country to pose with groundhogs in awkward (and potentially dangerous) photo ops. 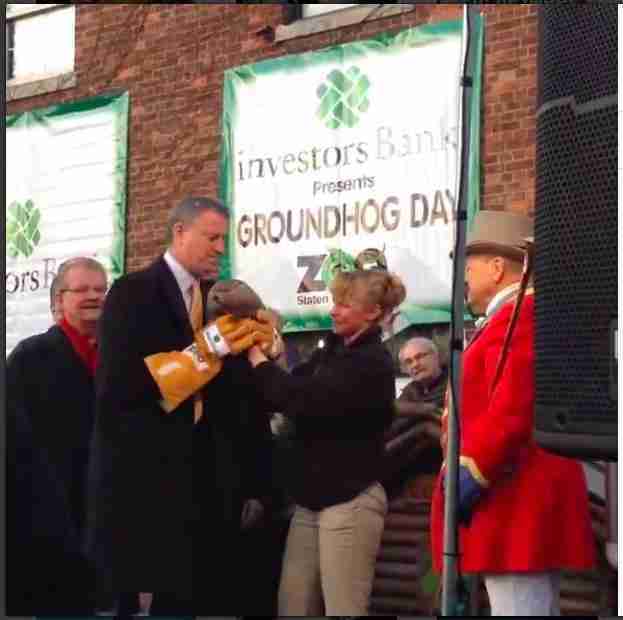 But this year New York City mayor Bill de Blasio won't be holding up a groundhog at Monday's event at the Staten Island Zoo, likely because neither he nor the zoo staff want a repeat of last year, when Charlotte the groundhog squirmed out of de Blasio's hands and fell to the ground. A few months after her fall, Charlotte passed away from "acute internal injuries," reported the New York Post. 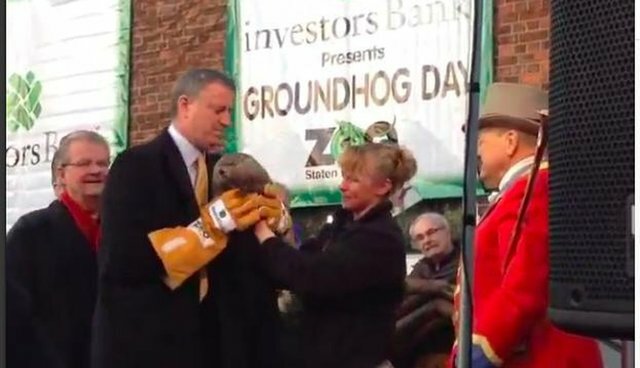 De Blasio, who is a noted champion of animal welfare, isn't the only one banned from contact with this year's groundhog. No one is allowed to hoist up the NYC critter this year, and Staten Island Zoo officials said that the groundhog will be in his or her own plexiglass box. Hopefully this makes New York City's event safer, but that doesn't mean the holiday is always in the best interest of the animals. The nation's most famous Groundhog Day locale, Punxsutawney, Penn., will host its annual celebration featuring Punxsutawney Phil, a groundhog who lives year-round as a tourist attraction in an enclosure at the local library. In 2010, PETA launched a campaign to send Phil to a sanctuary and replace him with an electronic groundhog, but retirement doesn't seem to be in the Punxsutawney celeb's future, at least not for now. UPDATE 2/2 - Phil saw his shadow, meaning six more weeks of winter, but at least no groundhogs were dropped this year!